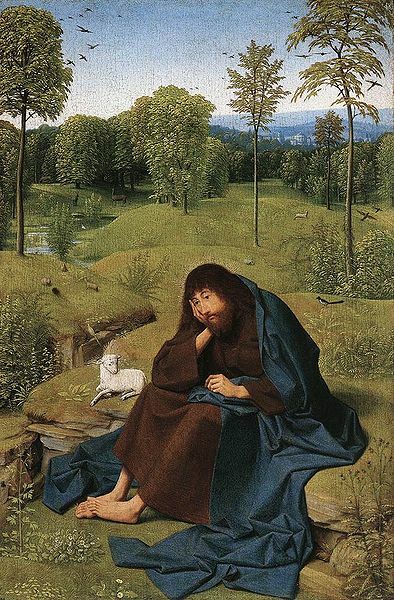 On a small panel, painted around 1485 by Geertgen tot Sint Jans, John the Baptist is lost in deep thought. With one hand he is supporting his heavy thinking head. While pondering, his knees beneath his rough camel hair mantle have parted and his large bare feet have apparently unconsciously slid across one another. John’s pose is somewhat ungraceful. Great thinkers do not concern themselves with their pose. The official title of this painting is ‘John in the Wilderness’. But there is no wilderness to be seen. If John had not been in such deep thought he could have enjoyed the serenity of the unspoilt nature around him – of the green hills, the tall trees and the murmuring stream. He would have discovered that all around him it was swarming with birds, little rabbits and deer. One might wonder whether the John of Geertgen tot Sint Jans really is John the Baptist. According to the evangelist Matthew, John the Baptist was occupied day and night with announcing the coming of the Lord. From dawn to dusk he baptised all those who came to listen to him. The peak of his active life was the baptism of Christ in the Jordan. The John of Geertgen is passively pondering. Does he not believe anymore in the message he had to bring to the world? Yet there is no mistake about it, the painter from Haarlem, the Netherlands, has painted John the Baptist. Next to him a lamb is lying with a aureole around its head. It is the ‘Lamb of God’ – the common symbol for John. John should be pointing to the Lamb who carries away the sins of the world, like the John that Grünewald painted on the Isenheim altar, but John with the large feet does not even notice the Lamb. He is thinking. Geertgen tot Sint Jans probably painted his meditating John for one of the Knights of Saint John (or Knights Hospitallers) in Haarlem, when he lived in their house in the Jansstraat. John the Baptist was the patron saint of the Knights of Saint John. Geertgen himself was probably not a priest, but as a painter he was allowed to live in their monastery. He painted a large altarpiece for the church of the monastery. The small panel with John most likely hung in a convent cell. It was meant for private devotion. ‘John in the Wilderness’ survived the iconoclastic fury of the 16th century. In 1625, when the last commander of the order died, the panel was taken to the Prinsenhof, a Dominican monastery, in Haarlem. Now it is part of the collection of the Gemäldegalerie of the Staatliche Museen in Berlin. Geertgen tot Sint Jans did not find his inspiration in the text of the gospel of St. Matthew, but in a biography of Saint John. In this story about his life John retires to a solitary place to reflect in solitude on the suffering of the Lord. His large feet crossing one another probably point to the Crucifixion. The Lamb has its forepaws crossed as well. Thanks to the Lamb who carries away the sins of the world, the desert where John preached again became a paradise. Aukje Bos-Geertsema: I saw the panel by Geertgen tot Sint Jans for the first time during an excursion led by Prof. H.R. Rookmaaker in 1972. After studying art history and philosophy at the Vrije Universiteit in Amsterdam, I taught art history. I now lead several museum groups and write reviews of exhibitions for the Dutch newspaper Nederlands Dagblad.